When I heard that Monster Energy Supercross 2 was releasing this February, my first question was ‘why?’. It’s less than a year since I reviewed the original Monster Energy Supercross, a game which I felt did a lot to impress but ultimately fell short because of its lacklustre career mode. 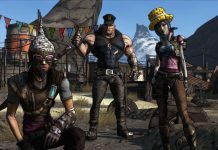 With the announcement of its follow up releasing just under a year later, I wondered how much developer Milestone could actually do to improve it. Surprisingly, quite a lot – although its career mode still has some room for improvement. Just like last year, Monster Energy Supercross 2 looks great. You’re not going to be blown away by the visual improvements introduced in this instalment, but you will be happy with the improved animations and the extra level of polish nonetheless. The touched-up visuals don’t affect performance, either. Playing the game on Xbox One X, I’ve never encountered any framerate issues during my time spent playing it. Oh, and those long loading times that plagued the original Monster Energy Supercross are now a thing of the past. There are small but meaningful changes as to how the game plays, too. Bikes feel a bit heavier in Monster Energy Supercross 2. It’s not really noticeable unless you switch between the games one after the other, but they do. It results in handling and dynamics that feel less twitchy. Your bike feels more grounded. I generally feel more confident belting my bike around a track in Monster Energy Supercross 2 because I feel like I have more control and feedback, and that’s never a bad thing. 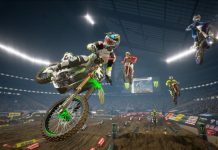 Monster Energy Supercross 2‘s improved handling and physics make it the most authentic and enjoyable supercross game yet, and it’s also the most accessible. Alongside the usual difficulty options and assists such as joint braking and the ability to rewind time, a new suggested flow option really helps new riders effectively plan their journeys over jumps and small bumps. 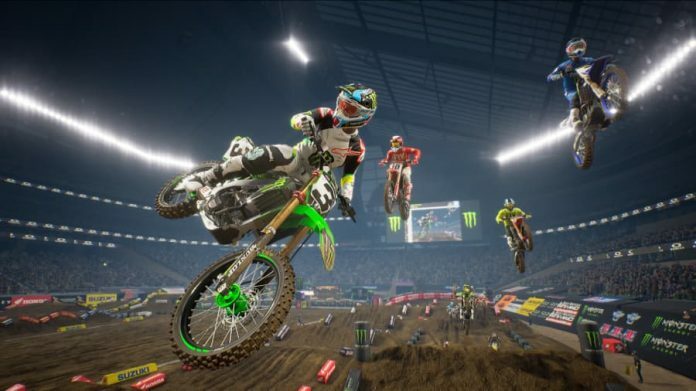 Supercross games are genuinely some of the most demanding racers out there due to the need to position your bike when landing to avoid losing speed and effectively carry momentum; Monster Energy Supercross 2 makes the best effort yet to drill that into newcomers. 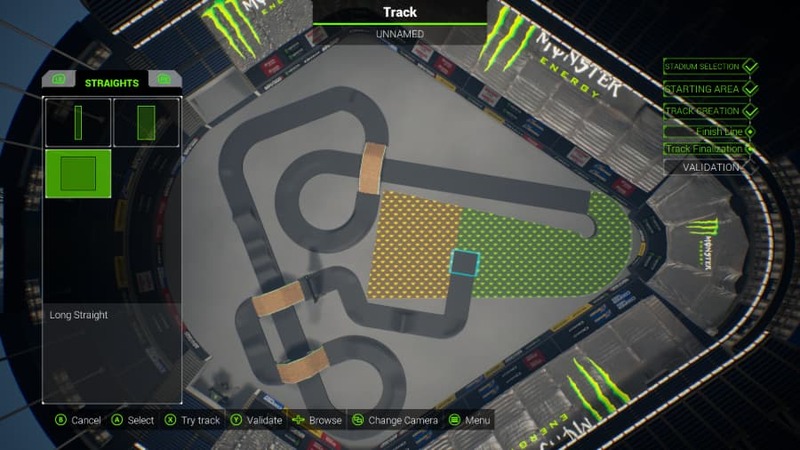 It’s Monster Energy Supercross 2‘s career mode where the biggest changes can be seen, though. Via the introduction of a schedule, each and every event in a 250SX or 450SX championship is proceeded by two or three activities plus some rest days. 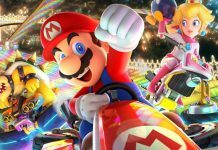 You can choose to undertake some training, completing tasks to improve your rider’s abilities as you earn stars, or you can challenge a rival, engaging in head-to-head or time trial events. 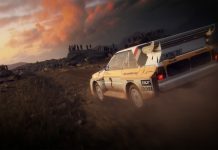 And if you don’t want to get yourself muddy on a track, you can take part in promotional or media days, boosting your money or fame with little effort. On paper it all sounds good, but in practice what you do in between championship events is pretty inconsequential. Training does eventually improve your rider’s abilities, but not enough for it to be really noticeable. Completing challenges unlocks new compound layouts, but time trial difficulty varies wildly, and the compound isn’t all that enticing. And promotional and media days are strictly passive affairs. 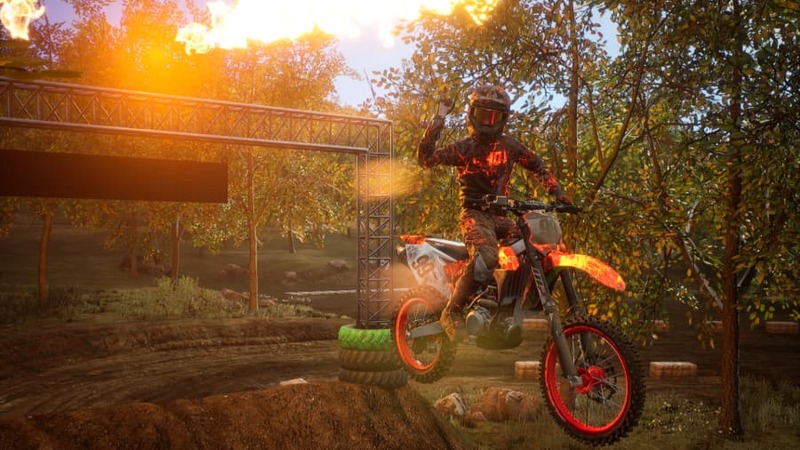 Unless you want to earn lots of money so you can make good use of the game’s new bike customisation options, you could quite happily ignore most of Monster Energy Supercross 2‘s new career padding altogether. Earning loads of money is the typical result of placing well in events while also landing the best sponsors by increasing your fame. Each sponsor will also pay out a set amount for a promotional day, so if you just want to amass sums of cash rather than challenging rivals and improving your rider’s skills, you can just take part in promotional events as often as possible. And with your wads of cash you can then play dress-up with your rider with more options than ever before. You can also customise your bike with a huge range of parts, many of which actually change the performance of your bike. Of course, outside of its career mode, Monster Energy Supercross 2 has all the other features you’d expect, too. 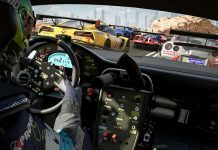 You can race online, take part in championships, and the brilliant track editor also makes a return. 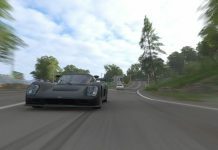 Now a little simpler to use, the track editor really does breathe some additional life into the game, allowing you to create some deviously challenging layouts that will test even the most skilled. Or you can simply create a flat oval and speed around as fast as you can. 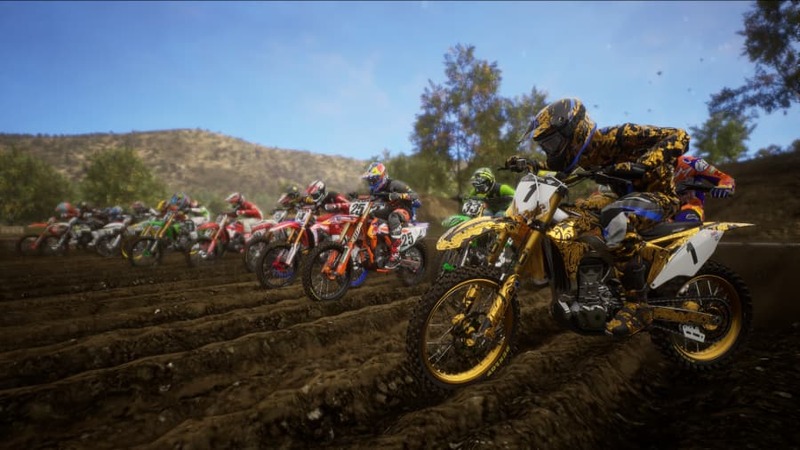 While Monster Energy Supercross 2‘s increased cosmetic options – including new finishing celebrations – don’t impress me all that much, the improvements to the core gameplay really do. There’s a real sense that you’re now driving on mud, with your bike slipping around on steep inclines and struggling to gain momentum after coming to a near standstill in sloppy mounds of dirt. It makes the experience more immersive, and also makes it stand out from the crowd. Without any doubt, then, Monster Energy Supercross 2 is the best supercross game available right now. It might even be the best supercross game ever made. It’s just a shame that even though improvements have been made to its career mode, it’s still not particularly engaging or noteworthy. 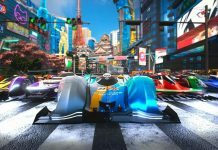 If you just want to race around real-world tracks and prove you’ve got the skills to come out on on top, however, it still does the trick. And then there’s huge amounts of fun to be had creating your own track layouts well into the future. Or at least until Monster Energy Supercross 3 arrives, anyway. Monster Energy Supercross 2 is available on PS4, Xbox One, Switch and PC. We reviewed the Xbox One version.